These tips were originally published to help those doing the Isagenix Cleansing and Fat Burning Program Internal Body Cleanse, however the tips presented here can work with Master Cleanse or any other natural internal body cleansing. Wherever the tips refer to an Isagenix product I will include a substitute item that you may already have in your own kitchen. 9. Find a Cleansing Partner to help keep each other accountable and provide encouragement and support. Craigs List – go to the Community Section under Activities. If you don’t find anyone looking for a Cleanse Partner, post a request yourself. You just might inspire someone to get healthy with you! 10. Do something during your cleanse that boosts your spirit, such as caring for a loved one or doing something kind for a stranger. 12. Don’t avoid being around people, just make sure to plan ahead so that socializing doesn’t include food. 13. Understand what’s happening to your body. Cleanse for Life™ offers gentle cleansing botanicals (not laxatives) that encourage better digestion and absorption of nutrients as well as B vitamins such as niacin that help to produce a healthy metabolism, improve blood flow and eliminate impurities. Because your body is releasing toxins and stored fat you may experience more frequent bowel movements that have a color different than your normal bowel movements. 14. Don’t forget to take IsaFlush!®, Natural Accelerator™ and Ionix® Supreme. This is not a sales pitch to purchase more Isagenix products. These products support circulation, fat burning and provide the proper nutrients that your body needs to sustain itself during your cleanse. 15. Drink plenty of purified water. This will improve your skin, boost your immune system and mood as well as aid in weight loss. To determine the minimum amount of water you should drink daily, weigh yourself and divide that number by two. That’s how many ounces of water you should drink each day. 16. If you’ve hit a weight-loss plateau, try adding a scoop of IsaPro® to your IsaLean® Shake on Shake Days. This is a practice that athletes use to increase their protein intake and may help boost your metabolism also. If you don’t have access to IsaPro Protein Powder or IsaLean Shake Powder you can substitute any natural or organic protein powder supplements. low-sodium organic vegetable soup- try Isagenix Creamy Chicken or Savory Tomato soups. 18. Eat light snacks throughout the day to maintain blood sugar levels. 19. If you’re choose to exercise, do so gently. Your body needs time to rest and rebuild. Try gentle stretching, short walks, Pilates or yoga. 20. Register for the Isabody Challenge! There’s nothing like a contest to inspire motivation! Scroll down to the links for Coaching Calls for inspiring articles and helpful tips and guidelines. Once you’ve signed up with Isagenix you can register for the Isabody Challenge. 21. Bonus Tip: Don’t do a liquid cleanse for longer than 2 days in a row or more than 4 days in a month. Severely depriving your body of calories for longer periods of time can alter your metabolism so that continued weight loss and maintaining your weight loss are much more difficult. Make today the day you get started on the road to internal nutritional body cleansing! Our body bears a strong resemblance to a big machine. Each part has its own important function. If we don’t take care of our body just like the machine, it will deteriorate. The reason why we are still capable of thinking, walking, running and doing all kinds of outdoor activities is because our body acts as a shield. We are protected by our excretory system which helps eliminate many of the toxins inside our body. These toxins can weaken our body and can really affect our thinking ability. If our body is full of toxins and our colon could no longer hold the large amount of toxins inside our body, our immune defenses will start to weaken as well. Detox cleanses supply and aid our colon. This method ensures that our body is free from any harmful elements which can cause diseases and can make our body weak. Each of our body parts is designed to effectively wash away toxins and impurities. However, these body parts, especially our vital organs, will not fully function if they have to spend lots of time flushing toxins from our body. Other functions of these organs are often neglected as their tasks are focused on getting rid of waste products. These can result in poor liver and kidney function. If these two organs fail to function normally, our body will no longer perform its duty in shielding the body from diseases. This will make us more prone to illness. This is where detoxification comes in. Detoxification has several functions such as preventing more toxins from entering our body and removing impurities from our colon. As a result, our body will resume their full functions and our cells will become rejuvenated. After detoxification, you will feel revitalized as the chemical substances inside the body are already removed. Obtaining a healthy and fit body is never impossible if we follow a balanced diet. We should include fruits and vegetables in our daily diet along with regular exercise. Drinking plenty of water everyday also does wonders for your digestive system. You will feel its effect once your bowel movement becomes regular. Try these best practices first before undergoing a detox cleanse process as this may improve your health and physical being. What’s In Your Internal Body Cleansing Super Juice? Everywhere you turn there’s a new super juice body cleanse on the market. Even popular juices are jumping on the bandwagon by adding a sprinkle of healthy ingredients to their regular products. This is reminiscent of the practice of adding nutritious ingredients to white bread, when what really needs to happen is to use nutritious ingredients in the first place. Adding Vitamin B to white flour doesn’t make it healthy any more than adding acacia to a sugar-laden, chemical filled juice makes it healthy. Many other products have nutritious ingredients in them. With so many colon cleanse products to choose from, how do you know which to choose to cleanse smart? When you’re ready to cleanse your body, look to see where you’re getting the most bang for your buck. Isagenix unique Cleanse For Life drink isn’t a one-trick-pony. Cleanse For Life is a complex blend of ingredients that support the body’s entire cleansing process (not just the colon), while nourishing you with essential nutrients as you’re cleansing your body. Drink one to two ounces of Cleanse For Life once or twice daily to keep on top of daily intake of toxins or to replace a meal to support weight loss or do a deep cleanse and get started on the road to better health and weight loss by choosing either the Isagenix Cleanse for Life 9 Day or 30 Day Programs. ** As part of the Isagenix Cleansing and Fat Burning System. “The Isagenix Cleanse For Life program is my favorite internal cleansing product because it’s organic, has vitamins and herbs that not only work as an internal body cleanser, but it keeps me from feeling woozy on days when I’m doing an intense cleanse. I use the Isagenix Cleanse Drink both to get healthy, clean out the toxins and to lose weight. It works beautifully on all counts.” Heather – Beverly Hills, CA More info. 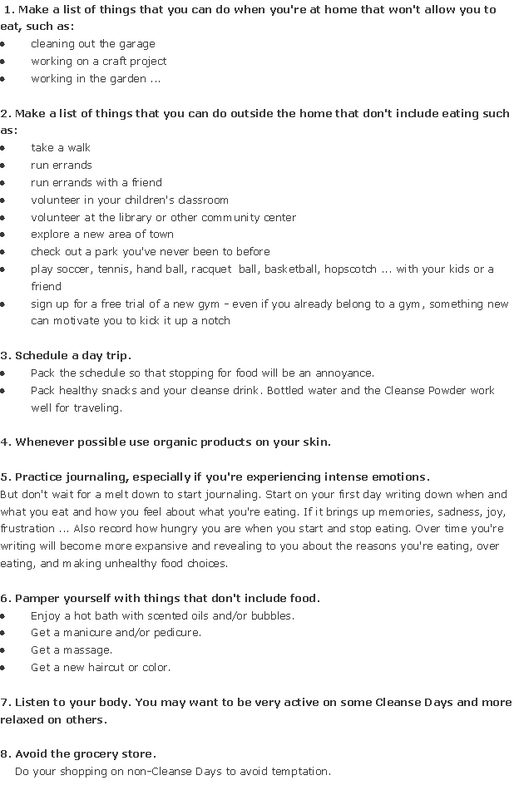 These “Tips For Successful Cleansing” can be applied to any type of internal body cleanse that you choose. These tips will help to make your Master Cleanse, Natural Colonix, Cleanse Smart and other popular cleansing program easier and more successful. Want more energy, better focus and a leaner body? Cleanse for Life is the answer! It’s unique because it actually replenishes vital nutrients as it cleanses your body. You can use Cleanse for Life in two different ways for best results. First, you can drink two ounces each day to aid the removal of surface-level impurities. Second, you can do a deep cleanse once or twice a month to help remove embedded impurities and shed unwanted pounds. You’ll be amazed by your results! Drink to your good health every day. Helps increase energy and endurance. More effectively lose unwanted fat and inches when combined with proper diet and exercise. Increases resistance to oxidative stress. Improves mental and physical performance. Accelerate the removal of impurities from the body. Nourish the body with vital nutrients to rapidly revive health. A body that has experienced a nutritionally supported cleansing and detoxification is a body that is stronger, resists illness better, is more efficient and performs at a higher level than one that is filled with impurities or that has gone through the stress of a non-nutritionally based cleansing. Many people notice an ability to reach and maintain their ideal weight with less effort. When you have a sluggish, toxic digestive system, your metabolism becomes slower, your energy level drops and you’re generally not strong enough to burn off stored fat by exercising or moving enough throughout your day. A cleansing program can help restore the balance in your body and increase your metabolism, which will kick start your body’s fat-burning machine. After a thorough detoxification, you’ll find yourself more inclined to eat healthier and make healthier lifestyle choices. Once you’re living with a detoxified system, improved digestion and a balanced metabolism you’ll find – that you have little trouble reaching and maintaining a healthy weight. Click Here to get started on the path to better health and real weight loss!